Directions for Setting the Woolf Reverse — In setting this valve gear, just as in setting any of the others, the first thing to do is to take up all lost motion in the cross head, connecting rod and main bearings, as well as in the eccentric, eccentric strap and all the valve connections. Then find both dead center points so that the engine can be placed first on one dead center, then on the other by means of the tram. Place the engine on either dead center, then, if there is no indirect rocker shaft between the valve and eccentric so that the eccentric rod moves in the same direction as the valve, the eccentric should be placed 180 degrees, or half of a circle, away from the crank. If an indirect rocker shaft is used so that the valve travels in the opposite direction from the eccentric rod, then the eccentric must be placed on the same side of the shaft as the crank, or just exactly opposite to what it would be if either no rocker shaft or else a direct rocker shaft were used. The effect of an indirect rocker shaft with any valve gear is to place the eccentric exactly half way around the shaft from where it would be without such a shaft. This may be illustrated by the diagrams shown in Figure 48. The upper diagram shows an ordinary plain slide valve non-reversible engine fitted with a direct rocker shaft. An inspection of the figure shows that the valve and eccentric rod both travel in the same direction, the only effect of the rocker being to increase the travel of the valve. The eccentric is placed a little more than a quarter of a turn ahead of the crank, just as if no rocker shaft were used. In the lower diagram an indirect rocker shaft is shown. Here the valve travels in the opposite direction to the eccentric rod, consequently in order that the engine may still run in the same direction the eccentric must be placed as shown, that is, just 180 degrees from the first position shown in the upper diagram. What is true in this regard for a plain slide valve engine is also true for the Woolf reverse when an indirect rocker is used, that is, it changes the position of the eccentric exactly half way around the shaft. In the plain slide valve engine without a rocker shaft, the correct position for the eccentric is a little more than a quarter of a turn ahead of the crank, but with an engine fitted with a Woolf reverse, the proper place for the eccentric is 180 degrees from the crank if no rocker is used or exactly with the crank if an indirect rocker shaft is interposed. After the eccentric is placed in what appears to be the correct position, as near as can be judged by the eye, reverse the engine and note if doing so moves the valve. If it does, shift the eccentric one way or the other a little until a position is found where reversing the engine will not move the valve. When this point is found, shift the valve on its stem until it has say one-sixteenth of an inch lead. Now place the engine on the other dead center and see if the lead is the same; if not, correct half of the error and the valve is set. With a valve gear of this kind it is impossible to give the valve either more or less lead and still have it equal on both dead centers. When the lead is made equal the valve is correctly set on its stem and it will have just the amount of lead the designer intended. In the case of the ordinary plain slide valve the lead may be either increased or decreased by shifting the eccentric; with the Woolf reverse the lead may be equalized, but it can not be changed from what it was designed to be. Some of the Woolf valves are so designed that there will be a slight movement of the valve, even if the eccentric is correctly set, when the engine is on dead center and the reverse lever is worked back and forth. A point can be found for the eccentric, however, where, the movement will be the least, and this is its correct position. If the pivot on which the guide block rotates (see Figure 49) is exactly in line with the center of the pivot by which the block is attached to the eccentric strap, then when the engine is on dead center, reversing the engine will have no effect upon the valve, unless the engine is moved off from center. The Woolf valve and all valves of its class provide for a constant lead for all positions of cut-off, on either the forward or backward movement, and provides for a much quicker opening of the port than a valve moved simply by means of an eccentric, such as, for example, a plain slide valve or a link reverse engine. It has been, and is yet, used widely on traction engines on account of its simplicity and the fact that there is only one eccentric to set in case of trouble, and because it is easy to put in correct adjustment in case it gets out of order. It is not, however, a perfect valve gear, although when correctly designed it gives good distribution of the steam and provides for as many points of cut-off as there are notches in the reverse quadrant. It is very susceptible to lost motion in any of its connections, a small amount being sufficient to account for a poor distribution of the steam. In this respect it is more sensitive than the link or a slotted eccentric valve gear. Owing to certain peculiarities in construction, the Woolf valve gear can not be made to work exactly the same on both motions of the engine, although when special care is taken in the design, the difference can be reduced to a small amount. It will generally be found, however, on examining valves of this kind, that they have a longer travel when the engine is running in one direction than when the engine is reversed. 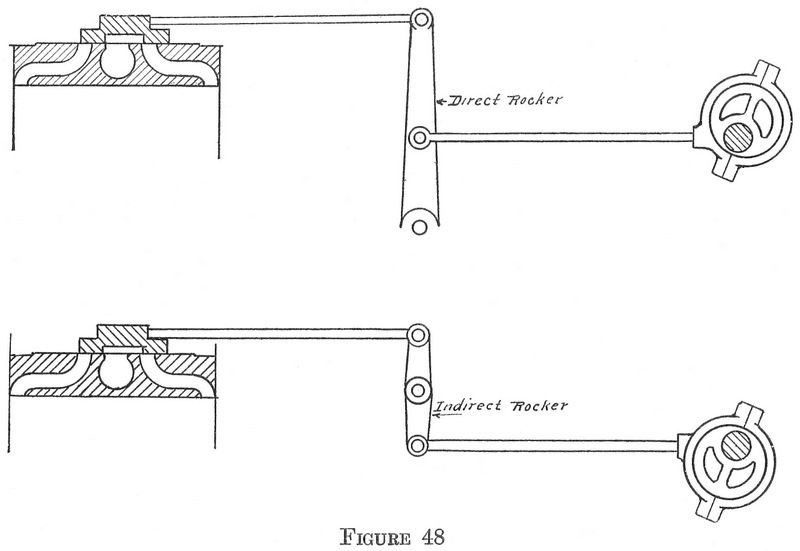 This difference may be reduced by making the reverse rod of such length that the guide for the block stands at a steeper angle on one motion of the engine than on the other. After an engine has been used for two or three years, the main bearing is apt to be worn down so that the shaft is slightly lower than when it was first put in place. This brings the center of the block slightly lower than the center of the guide and affects the steam distribution adversely. When this trouble arises the engine should be re-aligned, and the main shaft raised to correct height, and new boxes poured. In the case of Woolf compound engines fitted with a single valve, all that need be considered in setting the valve is the large central part which admits steam to the low pressure cylinder. If this is given the correct lead the high pressure valve must be set right, if it is designed correctly, because both the low pressure and high pressure valves are cast together. It may be mentioned in passing that the term “Woolf compound engine” does not necessarily imply that the engine is fitted with a Woolf reversing gear. A Woolf engine is one having two cylinders with a common cylinder head between them. Such an engine may or may not have a Woolf valve and reversing gear. The eccentric rods of a link reverse engine are frequently spoken of as being either open or crossed. Since the rods are always crossed either on one dead center or the other, the term needs to be defined. By common consent among engineers the rods are said to be crossed if they cross each other when the engine is on dead center, and both eccentrics are pointing toward the link. If the rods are parallel when the eccentrics point toward the link the rods are said to be open. 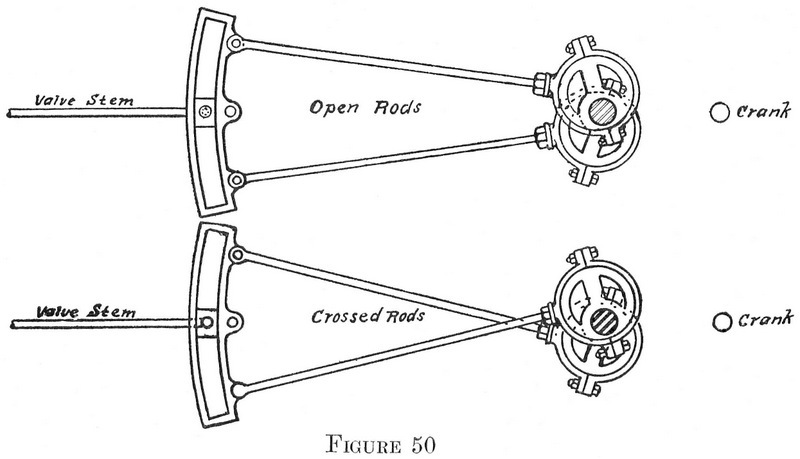 The two conditions are clearly represented in Figure 50, the upper diagram showing open rods and the lower crossed rods. Traction engines having a link reversing gear have the rods set crossed usually, but they may be set with the rods open if desired. “Hooking up,” that is, moving the reverse lever nearer to the center notch, increases the lead if open rods are used and decreases the lead when crossed rods are employed. 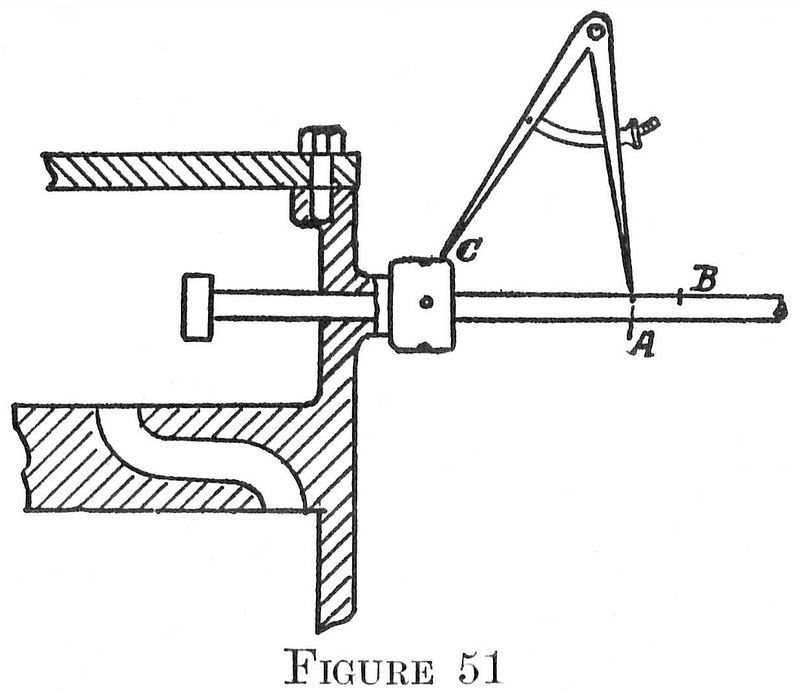 Consequently, putting the reverse lever in the middle notch will stop an engine having crossed rods, but if open rods are used the engine will not stop, ordinarily, when running light, because the valve opens the ports a considerable amount at the end of the stroke, thus admitting a considerable quantity of steam which expands behind the piston and pushes it forward. Directions for Setting the Link Valve — Two accidents are liable to happen in the field, either the valve may slip on its stem or one or both of the eccentrics may slip on the shaft. To determine just what is the matter, first put the engine on dead center, according to the directions already given and note if the eccentrics appear to be placed as they appear in Figure 50. If they are so placed they are probably all right. The next thing to do is to remove the steam chest cover and observe the position of the valve. If it has slipped, the fact can generally be determined by the old grease marks on the valve stem. All that is necessary to do in this case is to throw the reverse lever over to one end of the quadrant and shift the valve until it shows the proper lead on the side nearest to the piston. If it is impossible to tell by the grease marks if the valve has slipped, look to the lead, then put the engine on the other center, leaving the reverse lever in the last notch of the quadrant in both cases, and see if the lead is the same; if not, the valve has slipped and it should be moved on its stem an amount equal to half of the error. To test if the eccentrics have slipped, throw the reverse lever over to one end of the quadrant and then put the engine on dead center. Now observe the lead and then put the engine on the other center. If the lead is the same, but either too much or too little, it shows that the eccentric in line with the valve stem has slipped. It should be moved in the right direction to make the lead right and the set screw set down to hold it in place. When the first eccentric is set in this way reverse the engine and repeat the operation for the other eccentric. In case one of the eccentrics becomes broken, or something happens, making it necessary to put in new rods, the operation is a little more difficult because the rods must be adjusted to the right length. This operation may be performed as follows. Throw the reverse lever over to one end of the quadrant so that the valve will have full travel, then connect up both eccentric rods making them as nearly equal in length as possible by eye. Now put the engine on the crank end dead center, and rotate the eccentrics into the proper position as near as can be judged, with the rods crossed. Now rotate the eccentric which is in line with the valve stem clear around the shaft and see if the valve uncovers one port as much as it does the other; if it does not do so, change the length of the eccentric rod until it does. Leave the eccentric in its correct position, that is, just showing a little lead for the valve and set it in place with the set-screw. Reverse the engine and rotate the other eccentric around the shaft in the same way as the first, observing the travel of the valve and adjusting the length of the rod until it gives an equal movement to the valve either way by the ports. When the correct length is found for this rod rotate the eccentric to its proper position where the valve just shows the proper lead and set the set screw in the hub of the eccentric. If the second rod has been changed very much it will affect the first one and make it necessary to repeat the operation for the first eccentric. If this is done, and great care has been used in measuring the travel of the valve, the operation will be completed. In order to test the work, however, the engine should be placed on the opposite dead center and the lead observed when the reverse lever is first in one end of the quadrant and then in the other. If the lead is not right at this center correct one-quarter of the error by moving the valve on its stem and the other quarter by moving the eccentric. Do this with the reverse lever first in one end of the quadrant and then in the other, after which set the set screws in the hubs of the eccentrics down solid, and put on the steam chest cover, being careful to draw all the nuts down evenly. Then after steam has been admitted to the steam chest go over all the nuts again, as the expansion of the bolts, when heated by the steam, will be sufficient to loosen the nuts. In many link reverse engines the eccentrics are riveted in place and of course can not be changed in length very much. In case it should be necessary to make a slight adjustment at this point, the rivet holes may be filed out a little on one side. If a new reversing rod has to be inserted, care must be taken to adjust its length so that when the engine is on dead center and the reverse lever is in the middle notch the block will be exactly in the middle of the link. The link valve is generally set for equal lead, but when so set it will not have equal cut-off, owing to the angularity of the connecting rod. But when properly designed the difference in cut-off may be made quite small and so not affect the distribution of the steam very much. The lead is different at every different point of cut-off, either increasing or decreasing, depending upon whether the rods are open or crossed. In general, it is better to set the valve for the correct lead when the reverse lever is hooked up in the first notch from the “corner,” as this is its position when running, unless the work is either very heavy or very light. Directions for Setting the Shifting Eccentric Gear — In gears of this class the eccentric slides across the shaft either in a straight line or else along a circular arc. When hooked up the center of the eccentric approaches the center of the shaft, the effect being to shorten the travel of the valve, and increase the angle of advance so that the cut-off occurs earlier in the stroke. These gears may be hooked up as much as desired. In order to set the valve, first take up all lost motion in the engine parts just as in setting any other valve gear and place the engine on dead center. Now move the hub which carries the guides on which the eccentrics slide around the shaft until a position is found for it where reversing the engine will not move the valve. When this point is found screw the set screws in the hub down solid and then shift the valve on its stem until it has the right lead. Verify the work by turning the engine over on the other center and observing the lead. If it is not the same, correct by moving the valve on its stem a distance equal to half of the error. Directions for Setting the Marsh Valve Gear — The setting of the Marsh valve gear is generally considered a difficult operation, probably because the valve stem is attached to a small crank instead of to an eccentric and because this crank revolves in the opposite direction to the main shaft. As a matter of fact, it is not a difficult operation or one that differs greatly from the setting of a plain slide valve, as will be seen from the following discussion. The first thing to do is to put the engine on dead center with the crank pin nearest the cylinder. Second, the set screws located in the bottom and top of the stop plate or casting in front of the crank shaft should each be set out about three-quarters of an inch. The exact distance is not important, as this is only the first trial and is probably not their final position. Third, move the reverse lever either forward or back, it makes no difference which, until the gear box strikes the screw in the stop plate. Fourth, make a prick punch mark on the engine frame, steam chest or stuffing box at some convenient place as at C, in Figure 51. With one leg of a pair of dividers in this point make a mark with the other on the valve stem, as at A. Fifth, now throw the reverse lever to the opposite end of the quadrant and with the dividers still set as before observe if the point A comes back to its original position. If, as is often the case, the point of the dividers falls at B, it shows that the main gear G on the crank shaft, (Figure 52) must be moved a slight amount. Sixth, after gear G has been moved, repeat operation five, and if necessary make several trials until a position is found for G such that the point of the dividers will fall at the same place no matter whether the reverse lever is forward or back as far as it will go. When this gear is correctly located, fasten it securely to the shaft with the set-screw. Seventh, move the valve on its stem until it shows about one­thirty-second of an inch lead at the head end steam port. Eighth, place the engine on the other dead center and see if the valve has the same lead. Ninth, adjust the screws in the nearest stop plate, if the valve has not the same lead as before, until the lead is right, then reverse the engine and, if necessary, adjust the other stop screw until the correct lead is obtained. The valve should now be set correctly, but in order to be sure of results, the engine may be again placed on the head end center and the lead verified. It is better to set the valve when the engine is steamed up rather than when cold, on account of the expansion of the metal when it is heated, no matter what type of valve gear is being adjusted. With this valve gear, as with all others, be careful to go over all the parts and see that all bolts, set screws and jamb nuts are properly tightened and adjusted before turning on steam, otherwise some part may slip and the whole operation will have to be repeated. Valves — There are several styles or types of valves used to admit steam to the cylinders of traction engines which for purposes of study may be classified somewhat as follows: direct acting valves and indirect valves; balanced valves and unbalanced valves; plain slide valves and piston valves; multiple ported valves and poppet valves. It is not to be understood that the four classes of valves mentioned above are entirely distinct and separate from each other, because such is not the case. As a matter of fact, the classes overlap, as will presently be shown; however, by dividing valves in this way, it is much easier to describe them and easier for the reader to get an idea of the different kinds. A direct acting valve may be defined as a valve that moves in the same direction as the piston at the beginning of the stroke in order to admit steam into the cylinder. An indirect valve, on the other hand, moves in the opposite direction to the piston at the beginning of the stroke to admit steam to the cylinder. While it is true that most traction engine valves are direct acting, there are a few that are indirect. With an indirect valve the eccentric must be set directly opposite to the way it would be set for a direct acting valve, or, in the case of a plain slide valve engine, 90 degrees minus the angle of advance behind the crank instead of 90 degrees plus the angle of advance ahead of the crank, as is the case with a direct acting valve. Indirect valves are sometimes made in the form of piston valves and sometimes on the plan of plain slide valves. They may be either balanced or not balanced. Balanced valves are so arranged that the steam in the steam chest can not press upon the back of the valve. In order to accomplish this result the steam must be shut off from the back of the valve by some sort of casing or by a plate or ring that fits closely between the valve and the steam chest cover. This plate or ring, however, must rest on springs, so that in case water collects in the cylinder the valve will, under the heavy pressure, lift slightly from its seat and afford relief. If the valve is not balanced it is held to its seat with the full pressure of the steam in the steam chest acting upon the whole area of the valve. For example, suppose the valve is six inches wide and eight inches long and the steam in the steam chest is under a pressure of one hundred pounds per square inch. Since the area of the valve is forty-eight square inches, the total pressure holding it to its seat is 48×100 or 4,800 pounds. With a pressure as heavy as this, the valve will consequently be hard to move no matter how well it is lubricated; and whatever work is needed to move the valve back and forth on its seat is just so much work lost in friction. Under these conditions the valve is much more apt to become cut or scored because such heavy pressure squeezes the oil out and, moreover, the eccentric is more apt to heat on account of having to pull such a heavy load. Altogether it is much better to have the valve balanced. While the actual gain in power in the case of a well built engine can not be very greatly increased, the ease of working and the work done by the eccentric and its consequent tendency to heat will be greatly reduced. A plain D slide valve is the commonest type of steam valve used and has been previously described in this book. It is direct acting and may be either balanced or not balanced. A piston valve is just like a plain D valve rolled up into the form of a cylinder. Piston valves are always balanced valves, inasmuch as the steam pressure acts equally upon the valve in all directions. When steam is admitted to the cylinder past the ends of the valve it is direct acting, but when live steam flows into the cylinder from the middle portion it becomes an indirect valve. Piston valves, when in good condition, are very excellent valves, but when old and worn they leak steam badly and become wasteful. Multiple ported valves are those valves which admit steam to the cylinder through two or more steam passages. Figure 53 illustrates a cross section of a valve of this type known as the Giddings valve. Steam reaches the inside of the valve through the main port S, and from this point travels through ports a and b in the interior of the valve to the left hand steam port. The exhaust passes into the cavity P, as indicated by the arrow on the right, and is conducted away by the exhaust pipe — not shown in the figure. The advantage gained by using a valve of this kind is that a small movement of the valve provides it large port opening. In the case of the Giddings valve one-sixteenth of an inch of movement opens the port one-eighth of an inch. This is an advantage because it amounts to the same thing as a quick acting valve which opens the port quickly and closes promptly. Poppet valves lift straight up from their seats and depend upon some sort of a cam arrangement to lift them and a heavy spring to seat them. They have been used to a very limited extent on traction engines, but find their widest application in very slow moving steam pumps and in gasoline engines.